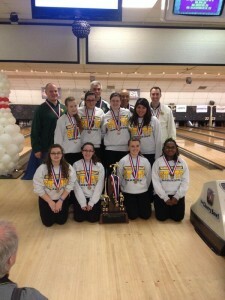 Waubonsie Valley girls bowling won their second straight Illinois state title on Saturday, beating second-place Leyden by 202 pins, with a total of 12,416. Senior Julia Bond was the individual champion, and finished the two-day tournament with 2,807 pins (a 234.8 average), which was the second best single performance in IHSA history. Rachael Felton finished 20th overall with 2,540 and Sara Barsotti was 70th overall with 2,212. It’s the first time that a school has won back-to-back titles since 2002, when Machesney Park Harlem won three years in a row. It’s the fifth state championship overall for Waubonsie Valley High School. The Warriors will hold an in-school celebration on Monday.